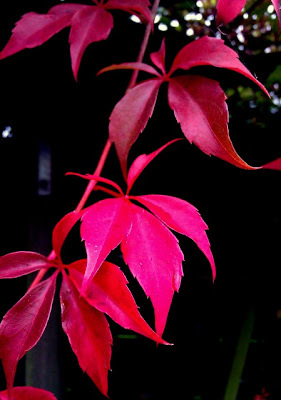 The leaves in my garden are turning bright red and are telling me that autumn has really arrived. Not that I needed red leaves to tell me this, because the horrible rainstorms were a great clue. I love summer, but we didn't have quite the summer I hoped we would have. I don't really know about the rest of the world, but in Holland, I think we just had the crappiest summer of my adult life. I honestly can't recall that we ever had that much rain before. But now autumn is here, and as much as I love summer, I think autumn definitely has it's charm. The wind howling around the house, rain against the windows, and me snuggled up in a big chair with some hot tea or a bowl of hot food. Speaking of food...it's the ultimate season for comfort food: stews, meat pies, soups...to name a few. I will be posting some of that lovely comfort food this season. As much as I will miss summer, I will be looking forward to make, eat and share my collection of autumn recipes!